Baseball season is upon us and the local teams are coming off of yet another season in which almost every team qualified and competed in its respective state tournament. Goodwin Tech made it the furthest, reaching the Class M quarterfinals where it lost to eventual champion Waterford. Berlin and Southington each made it to the second round, while New Britain and Newington fell in the first round of their tournaments. But the surprise of the season was Plainville, which failed to qualify in Class M, finishing just 7-14. It’s a new season, though, and while each team has lost some key players from last year, there is still plenty of talent returning and there is no reason to think this season won’t be another successful one. Innovation recently added a baseball program and is a wildcard to see how well it will perform. The talent throughout the area is certainly there for several teams to make deep runs, but for now, the focus is on getting the season off to a quick start. 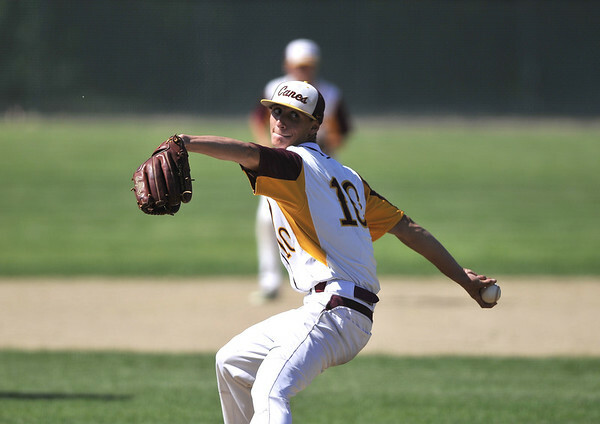 Outlook: The New Britain boys baseball team is coming off of a pretty decent season in which it lost just six regular season games. Things didn't go so well for the Hurricanes in the Class LL tournament though, as they lost in the first round to Fairfield Ludlowe. This year has the potential to be an even better season, however, for New Britain despite the losses of a number of key contributors from the past few years. Gone are players like Alex Silva and Tahj McCall, who will have to be replaced. The Hurricanes will be led by senior and All-State ace William Homar as well as junior Danniel Rivera, who plays both shortstop and pitches. Overall, there is no reason to think New Britain couldn’t make a deep postseason run. After all, the Hurricanes have the athleticism and talent to do so. Outlook: After a tough outing in the second round of the Class M state tournament last season, the Redcoats are looking to made strides to put themselves in a better position this year. Berlin did lose several key players from last season’s roster, including Cody Lacasse, but the Redcoats still have plenty of talent returning, which is set to feature a good mixture of younger players and veterans. Among the key names to watch could be Matt Vernacatola, Nicholas Carroll, Andrew Pulcini, Ethan Skinner and Gianni Fanelli. Berlin is always a strong program under head coach Leo Veleas and while there might be the occasional growing pain along the way, it’s safe to say expect another good season from this group. Outlook: The Indians know the talent they have on their roster this season and that’s why they’re expecting to be a leading contender, as it aims for a deeper run this year. Newington graduated five seniors from last year’s season, three of them being starters. But the Indians still have a stacked roster to get them back to the tournament. Newington will be relying on the depth of its pitching staff, as the team has Josh LeClair and Joey Zawizsa, both of whom were All-CCC picks a season ago, back along with Matt Dionne. Newington will also be relying on its speed. Although some of that could depend on the health of All-Stater Cooper Johnson, who is returning from a torn ACL. During the 2017 season, Johnson scored 25 runs and stole 24 bases, while hitting .408. Overall, this could be a fun team to watch this season. Outlook: As usual, the Blue Knights had another strong regular season last year and there’s no reason to think this season won’t be any different. Southington is expecting to be one of the top contenders entering the state tournament. The Blue Knights have lost a handful of important players including pitchers Ryan Sheehan and Jake Babon among some other considerable losses. But Southington should still be in good shape with Brandon Kohl and Jeremy Mercier returning to the staff this year. But how effective Kohl will be having torn his ACL in September remains to be seen. As for hitters, infielders Dan Topper and Kyle Leifert are expected to make some big contributions. Outlook: The Plainville boys baseball team took a few strides backwards in 2017 compared to its 2016 season, when the Blue Devils went 15-7. The hope is last year was just a fluke and this season will be more up to the program’s standards. The Blue Devils did lose several key players from last year's squad, including pitchers Jon Olson and Dwight Burns, but there is plenty of returning talent. Seniors Dylan Morrell and Jordan Bishop will both be returning to the infield. Still, it will be a wait-and-see approach with Plainville. Outlook: The Gladiators are used to having success and there is no reason to expect that to change this season. Goodwin Tech has qualified for the state tournament 11 out of the last 12 years with deep postseason runs nothing new. Goodwin Tech will be replacing last season’s pitchers Dave Plourde, Keith Selander, Matt Dziarkowski and Josh Masterson who combined for 12 wins. Having first-team all-conference players Tommy Hughes and Paul Prior, will aid to their success this year. Hughes went 6-1 with a 1.74 ERA and 77 strikeouts last season. He also hit .281 with 23 RBI. Prior, meanwhile, hit .415 with 34 RBI. What will also be different for Goodwin Tech is the Gladiators will also be playing in the CTC conference instead of the CSC this season. But don’t expect much, if any, drop off from this team. Outlook: Thanks to the addition of the players from Two Rivers High School, this will be the first year Innovation will have a baseball team. The hope if for new head coach James Fogarty to build a stable program, both short term and long term. As a new team, the Ravens are looking for the returners to continue their progress and help the new players adjust to playing high school baseball for the first time. But, as a whole, the team is young and inexperienced. Tyler Schienblum will be looked towards for his leadership and reliability. His steady fielding and pitching is also plus for Innovation. Melvin Saylor is mostly known for his ability to roam center field, but has some pop in his bat and speed on the base paths too. Saylor will also be relied upon to be one of the team’s dependable pitchers as well. Last but not least leading Innovation will be Steven Hicks, who provides a solid and consistent bat and should also be a solid pitcher for the newly formed baseball team. Hicks will also help to solidify the middle infield. Posted in New Britain Herald, Berlin, Goodwin Tech, Innovation, New Britain, Newington, Plainville, Southington on Friday, 30 March 2018 21:10. Updated: Friday, 30 March 2018 21:12.